Brazos is clearly faster than Atom in light workloads, but what about in more complex/heavier applications? Are the Bobcat cores enough to allow E-350 systems to move up in the world or will they still be confined to the web browsing/email usage models of netbooks? I've run the E-350 through our entire Bench suite to find out. 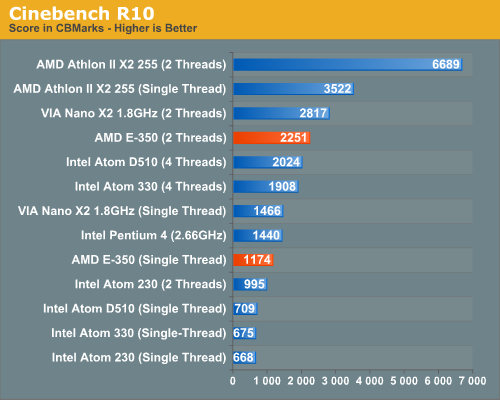 If you want the full gamut of results head over to CPU Bench, but I've chosen a few here. I also included performance results from a 2.66GHz Pentium 4 to put things in perspective for users of really old systems. 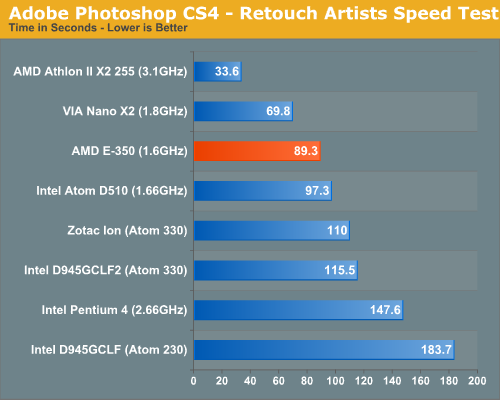 Photoshop CS4 performance is not half bad on the E-350 compared to other similarly priced platforms. Also impressive is the E-350's performance advantage over the old Pentium 4. 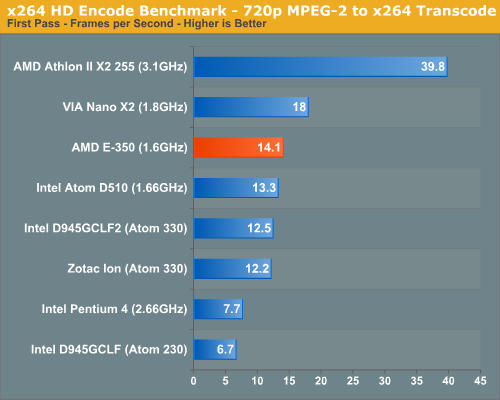 Compared to the Athlon II X2 however the E-350 is still noticeably slower. 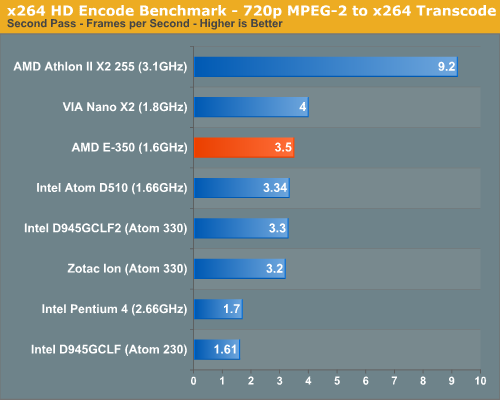 The standings and performance trends continue in our x264 encode benchmark. I don't expect you to do a lot of video transcoding on the E-350 as it's not much faster than Atom here. VIA's dual-core Nano is a bit quicker but still not enough to make this a viable usage case. Windows Media Encoder provides a far lighter workload, but the standings don't change. 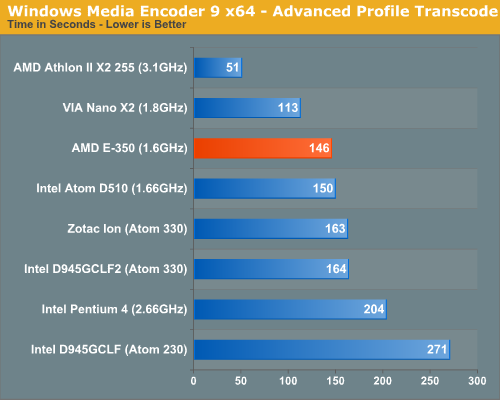 The E-350 is faster than anything Atom based, faster than the old Pentium 4, but slower than VIA's Nano X2. While I don't expect E-350 users to do any offline 3D rendering work, Cinebench does give us a good characterization of single threaded performance. The problem with Atom is that its single threaded performance isn't nearly as good as its multithreaded performance. In all of the previous benchmarks an Atom D510 is clearly quicker than the old 2.66GHz Pentium 4, but looking at single threaded Cinebench R10 you get a different story entirely. The P4 has nearly twice the single threaded performance of an Atom D510. The E-350 is still a bit behind the Pentium 4 in single threaded performance, but it's not nearly as bad as Atom. The out-of-order execution engine helps tremendously here. What you get as a result is a system that doesn't really feel slower than a 5 year old PC but has the features of a more modern system. 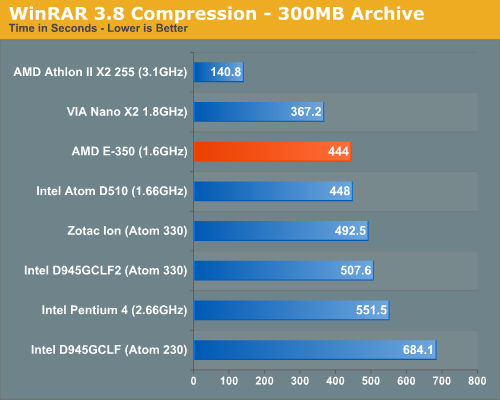 Overall the E-350 is clearly faster than Atom ever was at running these heavier workloads. The highly threaded workloads aren't much faster on E-350 vs. Atom thanks to the latter's Hyper Threading , but single threaded performance continues to play an important role and is a huge advantage of AMD's. VIA's simple out-of-order architecture is consistently faster than the E-350, however I don't expect to see widespread adoption or support for VIA's platform (at least compared to AMD's). Compared to the larger out-of-order x86 cores the E-350 is still in a lower performance class, the Athlon II X2 is easily twice as fast as the E-350 in these tests. 1) Swapping to disk is painful so you need enough memory (I'd recommend no less than 2GB for Windows 7, ideally 4GB) and you'll want a fast HDD. My preference is still an SSD, even a low end value drive over even a fast hard drive. Even a low end SSD (e.g. Kingston SSDNow V100) will make a Brazos system feel acceptably fast. 2) Outside of media playback and some gaming, you're still limited in the types of applications and workloads you can run on Brazos. The Brazos platform is great for web browsing/email workloads, but don't try to do too much more with it. The advantage over Atom here is that Brazos just does those things noticeably faster. "Remember that the Atom 330 is a dual-core CPU with SMT (4-threads total) so you’re actually getting 17.2% of four hardware threads used, but 34.4% of two cores." This is amazing performance for an 18W processor if you really think hard about it. This rig will beat my Athlon 1700+/KT266A/DDR-266/GeForce 4200 rig I had six years ago. No, no it's not. Intel will very soon release 17W ULV Sandy Bridge CPUs. Yes I am looking forward to ULV Sandybridge. I still have a Core Duo CULV which is starting to show its age. I'm sure it is still way faster than Atom and Zacate. You're only talking about the speed and if that's all you need, of course focus on a much pricier alternative. Now add in power envelope and price which is the entire point of this thing; moderate performance, very low power draw, dirt cheap. AMD nailed all of that. Brazos e-350 can be built as a tiny, passively cooled unit that costs a mere $100. If my neighbor asks me to build her a new system (again), this is EXACTLY what she'd want. It'll sit quiet 'n' cool in her living room right next to the TV and cost peanuts. "you'll have 2-3 times the CPU performance with SB" -> the things i use notebooks for don't need allot of CPU. If you do allot of PI calculations / video encoding / SETI , well , you should get a job. And when you do get a job, you will also understand why a 500$ notebook is better than a 1K$. I have a job and I'm running SETI (now it's called BOINC).